The Philippine Eagle (Pithecophaga jefferyi) is endemic in the forest of the Philippines particularly in the four major islands in the country namely eastern Luzon, Samar, Leyte and Mindanao. It is also the national bird of the Philippines. A bird of prey belonging to the to the family Accipitridae. John Whitehead was the first English explorer and naturalist who discovered the specie in 1896. This specie has no recognized sub-species. A male Philippine Eagle stands about 0 to 20% smaller and averages at about 91 centimeters (3 ft) and 5 kilograms (11 lb), the female is much bigger which measures about 112 centimeters(3.82 ft) long with an average of 102 centimeters (3.36 ft) long, making it as the world's largest living eagle. Upon its first discovery in the Philippines, it was called as the monkey-eating eagle due to reports from the natives who found it that it preys on monkeys where they got its generic name. Male and female of its specie are similar in appearance. They can fly by flapping their wings and soar occasionally. They are non-migratory and solitary type of birds that can be active only during day time. Its appearance is adorned with long brown shaggy feathers in its nape that looks like a lion's mane appearance. It has a dark face, and creamy dark brown nape and crown. Its back is dark brown with white colored underside and under-wings with heavy yellow legs and powerful dark claws, high arched and deep bluish grey beak. The Philippine Eagle has a long feathers in the head and the nape that form a distinct crest and dark brown cream feathery on the margins. They have white belly and under-wing while its upper parts are rich brown colored with pale edged feathers. The adults and the juvenile birds has a similar appearance but the adults have white margins at the back and under-wing feathers. It has yellow heavy legs with powerful dark claws and prominent large high arched bluish-gray beak are among its distinctive features.The Philippine eagle's eyes are blue-gray. Its wings are shorter than the larger ones like the Martial Eagle, Stellar Sea Eagle but quite broad with a greater surface area. An average Philippine Eagle frequently produces high loud pitched whistles as well as the little ones signaling they are begging for food. This specie of eagle can be found in the tropical, terrestrial habitat particularly dipterocarp and mid-montane forest that has an elevated ranges of lowlands to the mountains with a total estimated forest range was about 146,000 square kilometers (56,000 sq.mi). A pair of Philippine eagles have a territory of 60-130 square kilometers. Only six pairs can be found in Samar, two on Leyte and a few on Luzon. It can be found in Northern Sierra Madre National Park on Luzon and Mount Apo and Mount Kitanglad National Parks on Mindanao. 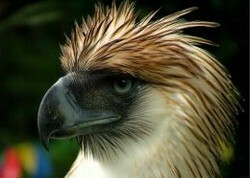 Some Palawan natives have claimed that the Philippine Eagle does exist in the island province. Some are under care of the Palawan Crocodile Farm. The Philippine Eagle Foundation of Davao City, Mindanao is one organization dedicated to the protection and conservation of the Philippine Eagle and its forest habitat. The Philippine Eagle Foundation has successfully bred Philippine Eagles in captivity for over a decade and conducted the first experimental release of a captive-bred eagle to the wild. The reproduction of Philippine eagle is so very rare about once to twice in a year until produces its offspring that makes one of the reason why it becomes endangered. It is reported by the statistics of The International Union for the Conservation of Nature or IUCN in 2008 that there are believed only about between 180 and 500 Philippine Eagles surviving in the Philippines making it to the list of critically endangered specie of birds in the world. It was blame in many aspects that triggers low life expectancy of the Philippine eagles to the people's abusive use of the environment, deforestation through logging, expanding agriculture, exposure to pesticides and so forth. One of the well known representative from World Wildlife Fund Charles Lindbergh who traveled several times to the Philippines between 1969-1972 was so fascinated by the eagle and persuaded the government to protect the eagle. In 1969 the Monkey-eating Eagle Conservation Program was launched and started to help preserve this species. 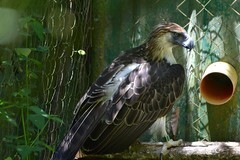 In 1992, the first captive-bred bird to be released in the wild, Kabayan, was released in 2004 on Mindanao; however, he was accidentally electrocuted in January 2005. Due to this cases the numbers have slowly dwindled over the decades to the current population of 180 to 500 eagles. From 1999 to 2000, 5 eagles have been shot in Mindanao. In the Sierra Madre of Luzon, 3 have been trapped from 2002 to 2003. From 1998 to 2002, 3 of 4 young eagles with transmitters on them were lost to hunting and trapping. Because of its size and majesty and the recognition that it was simply a beautiful bird, the Philippine eagle was declared as the country's National Bird on July 4, 1995 by the virtue of Presidential Proclamation. It is also known as "Haribon" or "Haring Ibon," which means "Bird King". Its local name is banog. It is among the tallest, rarest, largest, and most powerful birdsin the world. The Philippine Eagle, Pithecophaga jefferyi, also known as the great Philippine eagle or monkey-eating eagle, is among the tallest, rarest, largest, .. The Philippine Eagle Foundation firmly believes that the fate of our vanishing Philippine Eagle, the health of our environment, and the quality of..
What can you say about the Philippine Eagle? What a pretty bird! Love to read about eagles on Earth Day. Well done. Thank you for this article. The Philippine Eagle must be protected. Wow, the Philippine Eagle is a truly spectacular bird! Great information about the Philippine Eagle. Thanks for sharing. Awesome. I did not know about the Philippine Eagle before now. Thank you for sharing. Britain's only spiny mammal, the hedgehog is quietly dying out. The tiny animals are falling victim to our busy roads and boarded up gardens. What can we do to help?